This CPES mini-consortium program provides a unique, open, and collaborative forum for the power industry to explore, jointly with CPES researchers, new and emerging power conversion technologies seeking to meet what are the ever-increasing energy needs our modern society demands; from power semiconductors, to gate drivers, to converters, down to the impact they can have on power systems. As a mini-consortium, WBG-HPCS allows CPES to pool various resources seeking to develop the above pre-competitive technology, addressing common industry challenges, and effectively sharing research results among its members while leveraging CPES' expertise in WBG-based power conversion and its vast knowledge of electronic power systems accrued over the past 30 years working with the transportation and IT industries. 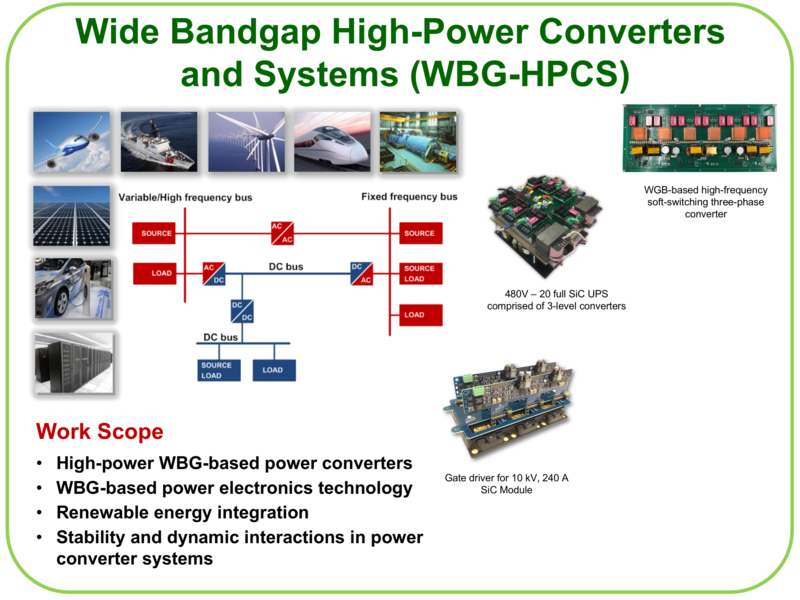 This has allowed the WBG-HPCS (since its inception in 2011) to move decisively into high-power, medium-voltage applications for grid, industrial, and transportation applications. In addition, CPES has continued striving to support research activities within the WBG-HPCS mini-consortium by securing funding, at the basic research level, from several government agencies, including the Office of Naval Research (ONR), the U.S. Department of Energy (DOE), DARPA, and ARPA-E. These agencies have been instrumental in the development of key enabling technologies presently in use in WBG-based high-power electronics applications, having pioneered many of them. As such, they represent ideal collaboration partners who generate invaluable synergy within CPES in pursuit of the mini-consortium's goals.